These toroidal rings are made of elastomers at high technological content ( FKM, FFKM evolast®, HNBR, VMQ, FVMQ, ACM, Aflas), on top of which our company also produces, and co-design along with our customers, many elaborate parts, in a wide range of compound batches both traditional and highly specific for the industries we work for :automotive, aeronautical and petro-chemical. Parts made of perfluoroelastomers evolast® are exclusively produced by MCM S.p.A., trademark owner. Technology, research, processing know-how, pursuit of the “full quality” objective, investments in tools and training are all essential elements to pursue success but, according to our philosophy, only if supported by what we consider the main company asset: human resources, for which we invested in the past and we will keep on investing in the future. The sealing rings known as "O-ring" are widely used in the manufacturing industries for their simple and practical shape. The O-ring is a circular cross-section elastomeric ring used as a mechanical gasket or as a sealing part. O-rings are designed to be inserted in specific grooves and be compressed during the assembling process of two or more parts, making therefore a sealing gasket. The “O-ring” gasket, unlike all other types of rubber gaskets, is the simplest and most “symmetrical” shaped of all: this peculiarity makes O-rings one of the most used and requested gaskets in the industry as, basically, they can be universally applied. “The United States O-ring patent was registered in 1937 by the Danish turner Niels Christensen who arrived in the USA in 1891. The patent kept on being passed among different companies up to the Second World War, when, the United States government declared key the introduction of the o-ring in the war manufacturing industry. They permitted its manufacturing to many other companies allowing thereby the production of the O-ring worldwide”. 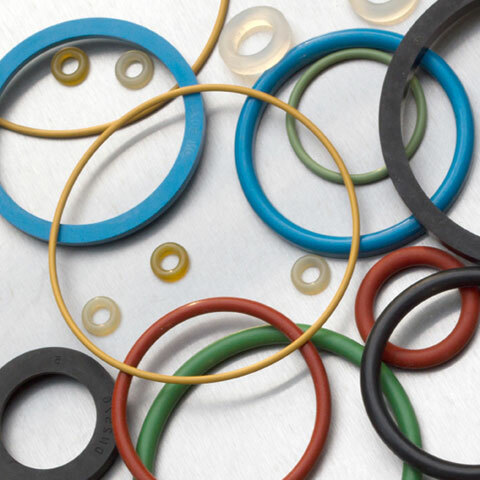 MCM S.p.A. can offer O-rings of any size and dimension (up to an inner diameter of 2.000 mm) of any elastomeric compound, from standard compounds (NBR, EPDM, VMQ … ) to special ones (FKM, FVMQ, HNBR, Aflas …) up to the new-generation compounds for special applications (FFKM). MCM S.p.A. is the exclusive manufacturer of evolast® products (the ultimate-generation FFKM) and holds its registered trademark. O-rings are made through vulcanization (presswork) using press machines equipped with steel moulds. MCM S.p.A. employs presswork procedure using injection molding method (for standard and widely demanded parts) and compression molding method for special compounds.